Bring our animal companions into our meditations? I saw a sparkling moment of real Doggie Dharma last weekend. At a Medicine Buddha retreat, a nice couple brought along their beloved 15 month-old pup. 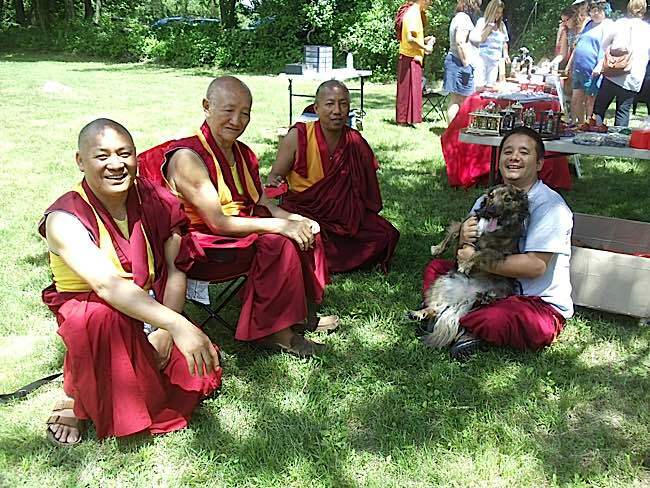 My kind teacher, Zasep Tulku Rinpoche, smiled as they lifted the pup for a blessing after the teachings. I had brought along my bell and vajra for blessing. Others, their mala. I didn’t even think of bringing my doggie companion! 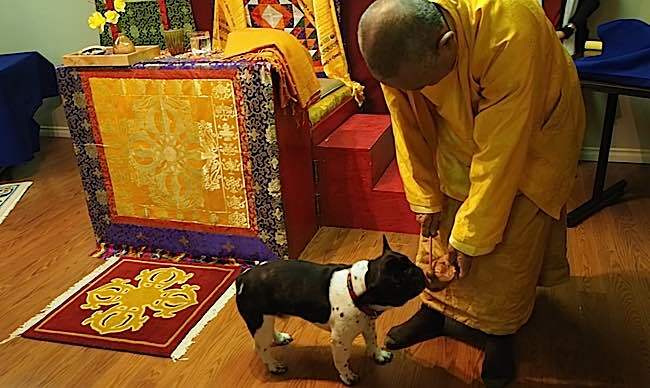 After the final blessings, Rinpoche played with this cute little dog on the floor and hugging him in his arms. The smiles on both of their faces conveyed real-life Dharma in practice. From a Buddhist point of view, dogs, cats, companion animals — in fact all animals and sentient life — are equally precious. 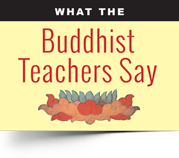 According to Buddha Dharma, all sentient beings also have Buddha Nature — the potential to eventually become enlightened. 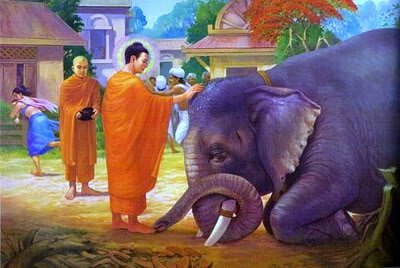 Buddha blesses an elephant. 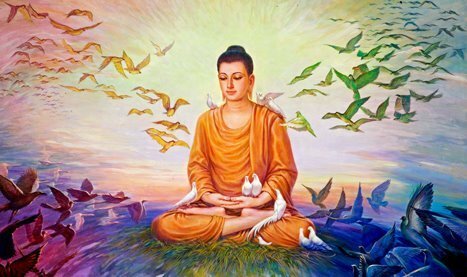 Buddha taught that all animals have Buddha Nature. 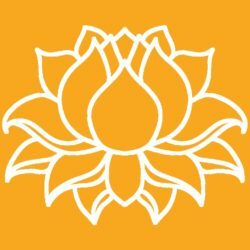 Lama Zopa Rinpoche, in a teaching on “animals in everyday life” wrote: “There is a story when Buddha gave teachings to 500 swans in the field and the next life they were born as human beings, became monks, and they all became Arya beings, able to achieve the cessation of suffering and the true path. So the result is unbelievable, just by hearing Dharma words.” This teaching illustrates that all animals have Buddha Nature. The swans, in just one life cycle, became humans, monks, and ultimately Aryas. 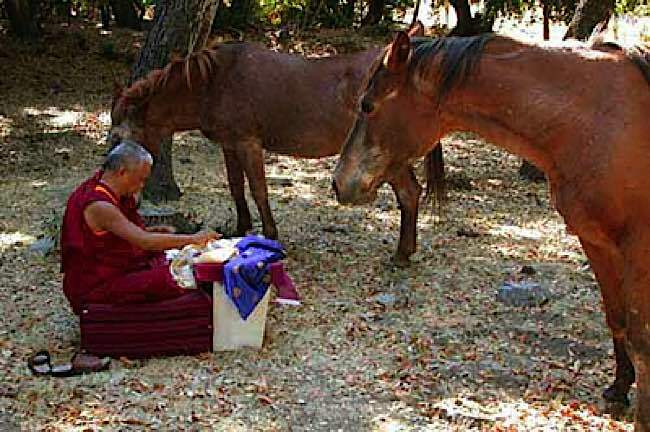 Lama Zopa Rinpoche blesses horses at a rescue farm. 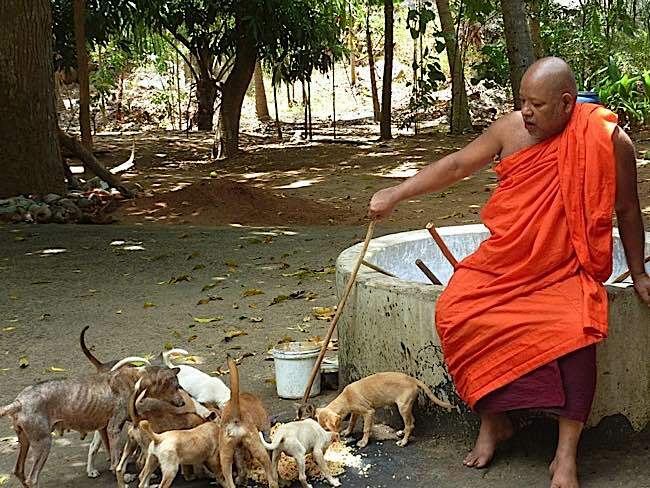 Buddha blesses the animals. 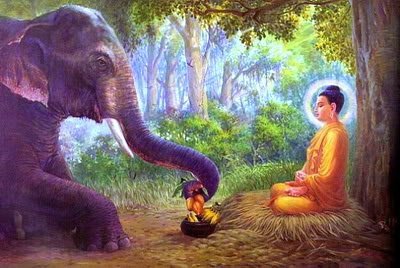 Buddha taught that all animals have Buddha Nature. Most Buddhists are familiar with these stories. Yet, in real life, do we really treat our animal companions as fellow journeyers on the path to Enlightenment? If we did, we’d bring our pets meditation rooms and retreats (with Teacher’s permission, of course! )— as the nice couple did during last weekend’s Medicine Buddha retreat. We’d acknowledge our companions are subject to Karma, just like us. This means that, as their friends, we need to be mindful of their actions, as much as our own, because they, too, have Buddha Nature. They, like the swans, can become Aryas (Enlightened Beings). 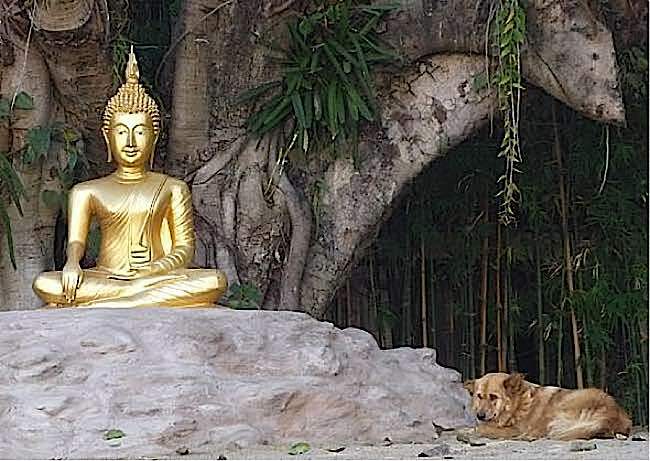 Dogs in Thailand can find sanctuary in any Buddhist Temple. Nearly every temple has resident stray dogs, fed and cared for by monks despite the fact the monks have to beg for their own food. Theodore Tsaousidis explained you have to take responsibility. “If you refuse to be honest about every single choice you make in your 24 hour day, then Buddhism, for you, is just another distraction.” When we take on responsibility for animal companions, we also take on choices that affect them, their development, and their future lives. At the Tibetan Buddhist Centre in Redding, they perform animal blessing ceremonies. At the event in 2014, nearly 100 residents brought dogs, cats, horses, turtles, sheep and goats to be blessed. 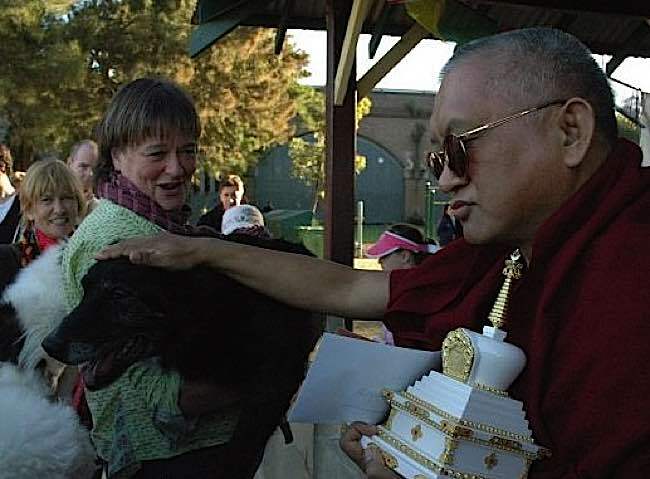 Lama Zopa Rinpoche giving blessings of a dog at teachings. 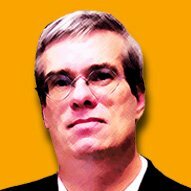 He writes in his popular advice web page: “this makes a huge difference. It has inconceivable result, unbelievable result. That makes them have a good rebirth in the next life, to be born as a human being and meet the Dharma.” He also recommends blessing their food. 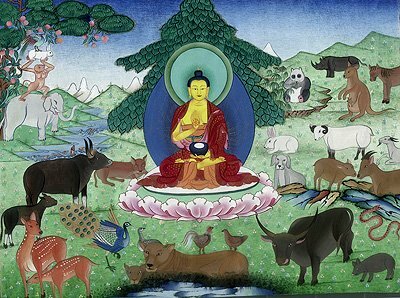 For sick animals you can recite Medicine Buddha healing mantras over medicine or water and then blow on the liquid before giving to an animal. In the case of a deceased companion, the same mantras are beneficial, chanted at least 21 times, preferably 108, blowing water and visualizing the deity or the deity’s blessing light being absorbed. Then pour the water on the deceased. For a dying animal, Lama Zopa Rinpoche recommended saying the entire Medicine Buddha sadhana. 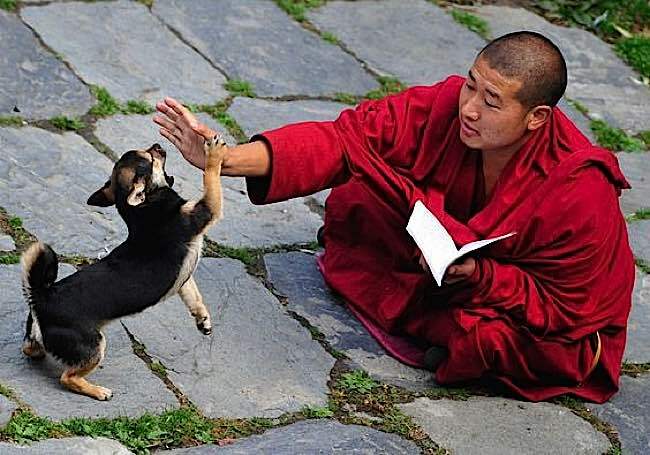 A monk, while in practice, shares with a puppy. Venerable Chodron also advised: “So read Dharma books or short texts or prayers out loud to him, e.g. the Heart Sutra, The Three Principle Aspects of the Path, The Foundation of All Good Qualities, etc. Say lots of mantra so he hears it.” She was speaking to a student who’s pet was dying, but the advice is best applied much earlier, long before sickness and end of life issues. Many Buddhists encourage their pets to settle down in a room where they meditate or perform daily sadhanas. Cats, in particular, seem drawn to practice, often snuggling right in the lap of the meditator. Of course, highly precise, advanced tantric practices might not be the best for pets, but for simpler practices — quiet breathing practice, mantra practice or sutra reading — the company is very beneficial. Personally, I’ve found my dog, cats and horses all respond noticeably to mantras, and I chant them whenever I am with them. When I’m feeding the horses, I’m inevitably chanting the Medicine Buddha mantra, remembering His vow to heal and save all beings, and in particular his vow to help all beings and animals. The teachings say that his mantra, when chanted to animals, sets them on the path to higher birth. All over Asia, dogs know they can come to compassionate monks for food and care when no one else cares. Buddha is often portrayed in stories and illustrations with animals. We usually only start thinking of Doggie Dharma when a beloved pet is about to pass away, or has already died. Buddhist forums fill up with discussions on the Buddhist view on Euthanasia, and rebirth and other ethical hot buttons, almost always started by a struggling Buddhist caregiver facing the end-of-life of a beloved companion. As Buddhists, we often take solace in the doctrine of rebirth at such times. Buddha was clear on this. Animals, like humans, take actions and are subject to karma and rebirth. Therefore, our actions as their caregivers also have karmic implications — including that hot potato euthanasia. The time to think about Dharma and a beloved pet’s Karmic well-being is from the first day you adopt — not just when they are sick or dying. For many animal companion lovers, this is a relief, particularly as their friends typically have shorter lifespans. The idea that their beloved companion will be reborn is a major consolation. 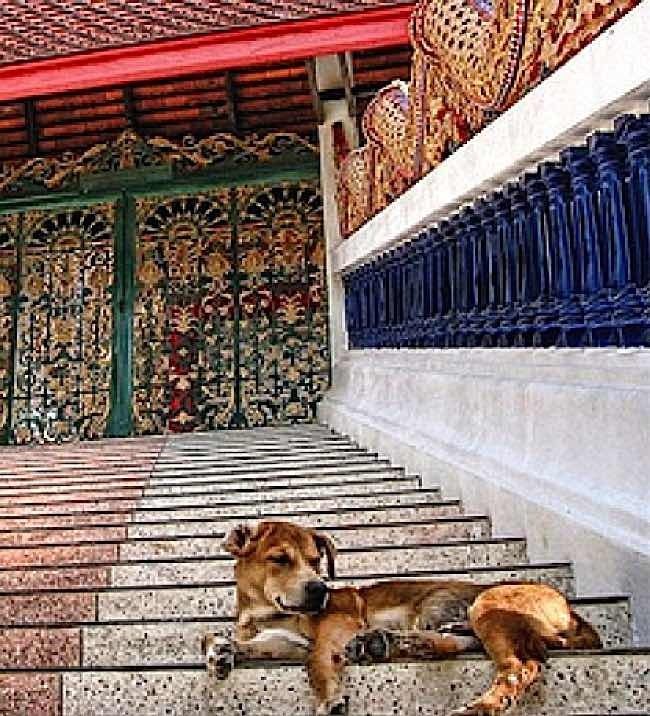 Dogs are permanent residents in Thai Buddhist temples, where euthanasia is unheard of. Often, old or sick dogs are dropped off at temples because Thai’s know that monks will care for them. If a beloved pet is sick — just as we might for our human family members — make a doctor’s appointment, but also meditate on the Three Jewels, perhaps chant mantras or sutras. We might chant the mantras over our pet’s water, or their medicine prescribed by the vet, then blow on them, just as we would for our children. We, as caregivers, inevitably take on the potential for negative karma from the moment we adopt. There’s positive karma, of course, especially if we rescue an animal from the pound or the streets, or take on an elderly or infirmed pet when no one else will. As we care for our loved one, that’s all positive, of course. 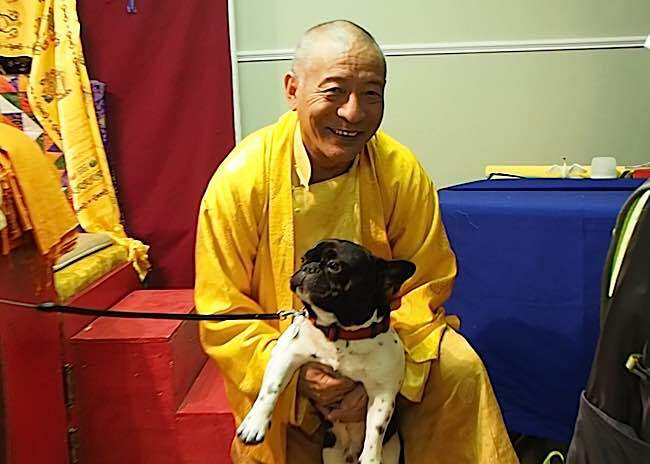 Venerable Zasep Tulku Rinpoche, spiritual head of Gaden for the West and Gaden Choling Toronto, takes a moment to play with a puppy brought to a Medicine Buddha retreat for blessing. The retreat was in Owen Sound, hosted by Mindfulness of Grey Bruce and Theodore Tsaousidis. Where does the negative karma arise? If we believe meat derives from killing, the precepts come into play, notably the prohibition from taking life when we buy dog or cat food (See “The Precepts”, below). But, just as with humans, the negative karma may not apply if the killing is not specifically for our benefit. In one sense, as caregiver, we are preventing our companions from killing. If not fed, their natural needs as predators (in the case of cats or dogs) would arise, bringing on negative karmic implications on their mind streams. As the more “responsible” partner in the relationship, we make decisions for our companions, which restrict their free will. Other negative karmic implications can occur if we spoil our companions; they may become unmanageable or hostile in society. And so on. It’s no different with children. These are all potentially negative karma for us. 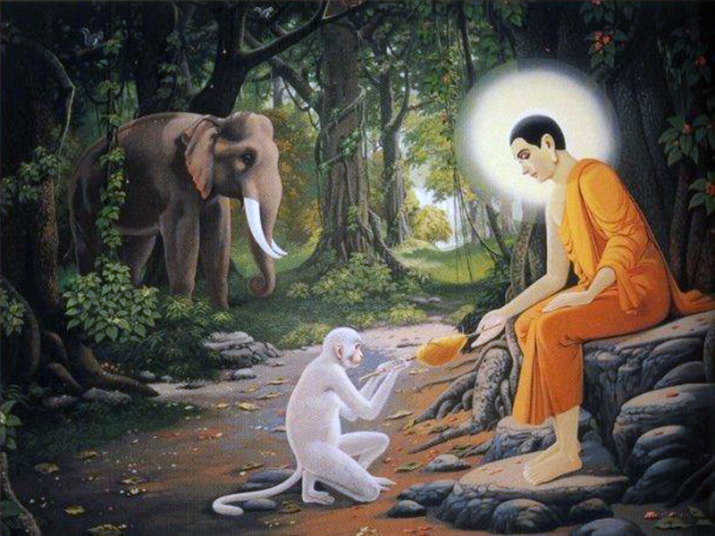 Most Buddhists, as compassionate people, tend to love animals. Yet, even if we don’t have that affinity or desire to care take animals, our behavior in daily life still has to reflect our Buddhist compassion and our acceptance of karmic consequences. Theodore Tsaousidis (right) was asked to teach by the most Venerable Zasep Tulku Rinpoche (left). Inevitably, in most countries, when our companion is suffering terribly at the end of life, and the veterinarian gives no hope, euthanasia rises as an issue. In Thailand, where the population is mostly Buddhist, euthanasia is unthinakable. For this reason, thousands of dogs are taken to temples to die in peace under the care of monks. They know monks consider life precious and will share food— this despite the fact these monks depend on alms themselves to live. Others Buddhists, unable to cope with the pain their animal companion is enduring, might consider euthanasia — acknowledging, as they do so, that they are taking on the negative karma of taking a life. One of my personal friends had this experience. She explained that she took on the negative karma from euthanizing her companion gladly — just to stop the suffering of their pet. It is inarguable that Buddha taught that animals are considered sentient beings. Dharma also clearly teaches that humans can be reborn as animals in future lives, just as animals can be reborn as humans. The Precepts also prohibit taking life, including animals. Many Mahayana meditations, sadhanas and prayers use language such as “all beings, all of whom have been our mothers…” — a constant reminder that every being, even the insect we step on by accident, is potentially our family. Ultimately, Mahayana Buddhists accept that humans and animals are interconnected as a single family. All this to say, your doggie, kitty, hamster, budgie and extended animal companions all have both Buddha Nature and karma. In what ways does this change our relationship to our beloved companions? The prohibition on all killing one reason some Buddhists are vegetarian — although there is no precept prohibiting meat specifically. 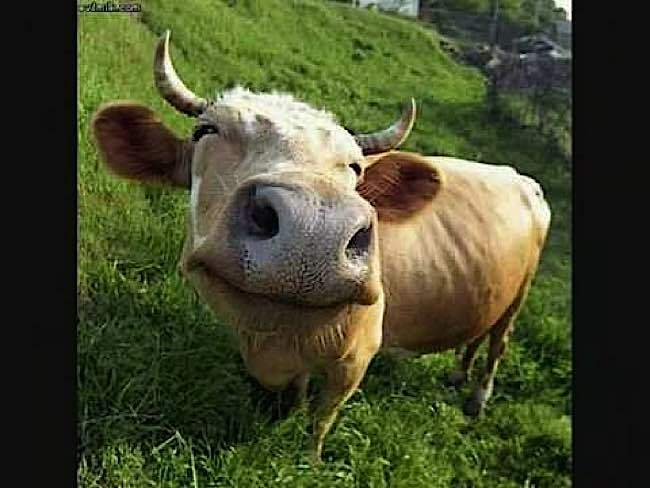 You are prohibited from killing for meat, but if you were given meat, in theory, you could eat it. However, if your demand for meat contributes to the slaughter of animals, it carries negative karma. A monk, for example, could accept donated meat, but the animal must not have been slaughtered specifically for the monk. Because of this precept, some strict Buddhist monks used to carry fly swishes to carefully whisk away insects without killing them. This notion is not fanciful. In the Golden Light Sutra, Shakyamuni, in a past life as Prince Sattva, fed himself to a tigress and her babies so that they would not starve. 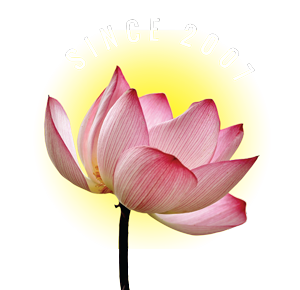 For less traditional Buddhists, secular Buddhists or “Buddhists without beliefs” rebirth is not necessarily accepted as fact — although karma certainly is — making Doggie Dharma a more straight-forward discussion. But, as it is certain that rebirth was taught by Buddha, most Buddhists accept the wider implications of animal Buddha Nature and the cycle of lower/higher rebirth. 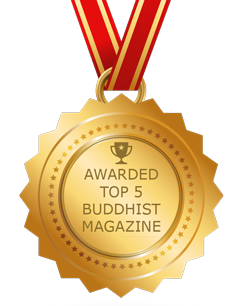 “A Buddhist lesson in pet care” by Eric Becuchemin, Radio Netherlands, Feb 2006, The Buddhist Channel. “Buddhists offer blessing of animals: chanting, prayers greet pets for good health, better future” by Catherine Samose, Special to The Redding Pilot. “Euthanasia with a good heart” Lama Zopa Rinpoche, fpmt website. I need to be in touch with someone who can guide me. These days I am seeing stray dogs on the road too often…who nearly come under my car. First it was a small puppy i could avoid him i wanted to do something for him but i couldnt bring him home. Second i saw a van hitting a dog on the road i stopped to put him aside on the road.. stopped a car to help me..the driver lifted the dog to put him aside as i didnt want other vehicles to crush him. Driver gave him water and the dog died i stayed with him for a while. These things pain me and these days im already facing bad times… why is this happening now i cant see dogs dying in front of me it hurts me. In my country all cats that are paralyzed in their legs have to be killed. They can not live a life with for example a wheelchair. My kitten was euthanized today against my will. he was paralysed in his back and couldnt walk. The Swedish law says he had to die. But in the more part of the world pets with are allowed to walk with wheelchair. In Sweden a cat even can be killed only because of irritation in their ears. I am now traumatised about this happening. What do you say about the Swedish animal welfare law? I am now traumatised about this happening. What do you say about the Swedish animal welfare law? what shall I do? I am now traumatised and I also cry and mourn for my kitten when I lay on bed and shall sleep.This has affected me so bad. That’s so very sad. I mourn for you. I’m not sure what you can do except lobby for change. If it were me, if that were in my country, I would definitely lobby to have such a inhumane law reversed. I’m sorry for your loss.